From the ever-growing network of bike lanes and trails throughout the region. From the recently-installed bike racks outside your favorite businesses. From the Metro cars and buses that you can take your bike on (on those days you and your bike just need a lift). From the cyclist-protective laws now on the books. From the fast-expanding network of Bikeshare stations. From the increased number of confident city cyclists on area streets and trails. By being a WABA member, by supporting our advocacy efforts, you are helping to bring about better bicycling in the region, and thereby, creating the ultimate member benefit: a bicycle-friendly community! Friends or family in town for the weekend? Wanting to take them out on a trail ride or cruise around the city for an afternoon? Don’t have enough bikes (or the right size or style) to accommodate everyone? Bike and Roll is the answer! Rent a Bike and Roll bike and explore the Nation’s Capitol. Even better, try out one (or all) of their bike tours, combining history, sites, and/or politics with biking! What could be better than that? A DISCOUNT! 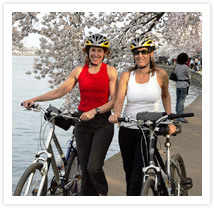 WABA members receive $10 off bike rentals and $10 off bike tours! Yet, that’s not all. Bike and Roll also regularly partners with WABA to provide free bikes for our Learn to Ride classes. They truly are a bike-friendly business helping to make the Washington area more bikeable. Now that’s a member benefit! Topics: Uncategorized. Tags: members, news. Previous BikeFest is your chance to win big! The countdown to your favorite bike ride is on. DC’s Budget needs to reflect its values. Learn how to pilot a tandem!